Multi-vehicle swarms offer the potential for increased performance and robustness in several key robotic and autonomous applications. 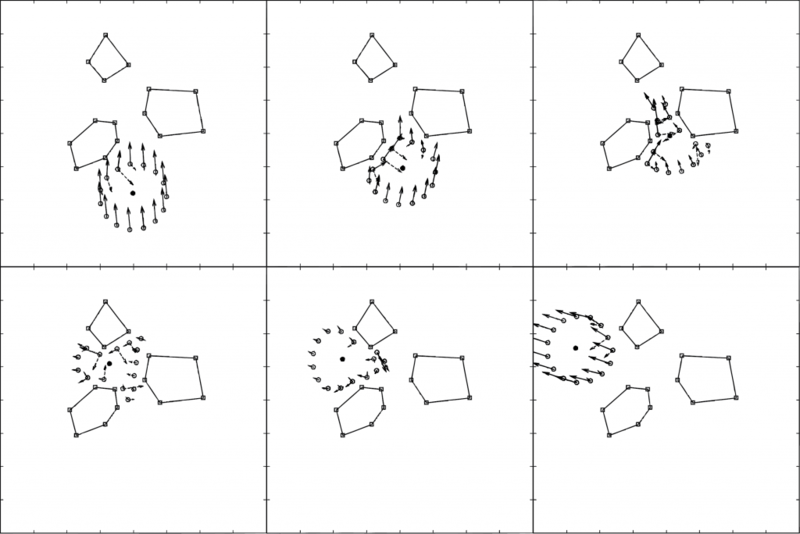 Emergent swarm behavior demonstrated in biological systems shows performance that far outstrips the abilities of the individual members. We demonstrate a lightweight formation control methodology that uses conservative potential functions to ensure group cohesion, and yet has very modest communication and control requirements for the individual nodes. Any arbitrary formation can be formed and held, even while navigating through an unstructured obstacle environment. Simulation studies demonstrate that the formation control is robust, stable, and easily implemented in a distributed fashion. The key insight into this form of formation control is that the forces from the artificial potential functions (attraction to center of mass, repulsion from each other and obstacles) are not used to determine the trajectory. Rather, the forces in the current formation are used to determine the initial departure, the equilibrium where the forces are zero determines the short term goal, and each individual node plans its own trajectory to that goal. Thus the control is a simple trajectory following, and this trajectory is re-planned in a receding horizon fashion. This ensures collision free trajectories, as well as well behaved dynamics and damping. I undertook this project as an undergraduate at UC Santa Cruz. Dr. Gabriel Elkaim was kind enough to take me under his wing and give me an opportunity for undergraduate research. There was no formal undergraduate research program so it required a bit of tweaking the system. The work was all simulation based and very mathematical – mostly matlab. All of these concepts and tools were very new to me at the time, so everything aspect of it was a significant learning experience. Our work culminated with a paper presentation in Prague at IFAC where I believe I was the only undergraduate presenting – another interesting experience. In collaboration with Dr. Gabriel Elkaim, founder of Autonomous Systems Lab at UC Santa Cruz. More information can be found here. The following videos show the result of a number of different simulation scenarios all of which were executed in Matlab.